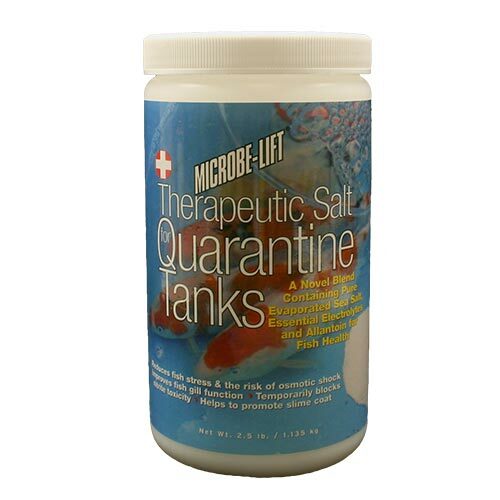 Microbe-Lift/Therapeutic Salt For Quarantine Tanks reduces the amount of energy a fish must expend to maintain osmotic balance, in fresh water fish, this energy can be substantial. If your fish is suffering as a result of a nitrite spike (a.k.a. Brown Blood Disease), ML/Therapeutic Salt For Quarantine Tanks acts to slow the rate of nitrite uptake - possibly the difference between survival and death, with electrolytes, minerals and Allantoin, which accelerates wound and fin healing, ML/Therapeutic Salt provides the necessary elements pond fish require to reduce stress and develop a healthy slime coat. 1/2 cup (120 g) per 10 gal. (38L) of water. 5 cups (1.13 kg) per 100 gal. (378L) of pond water. 2 tbls. (30 g) per 10 gal. * 1 1/2 cups (360 g) per 100 gal.